The deal starts in February 2018 and facilitates a faster deliveryand service of Beetronics products in all countries in Europe. 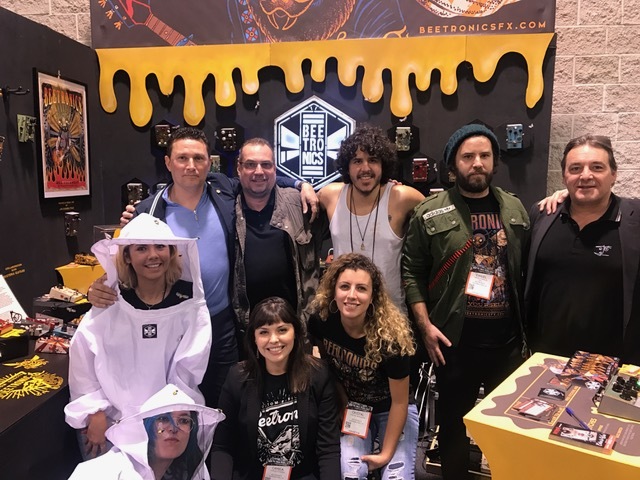 ‍The FACE & Beetronics Management Team sealing the deal at NAMM2018. “We are very excited to be partnering with FACE and with the opportunity of expanding our business. Our products are made in California and it is very important for us to be well represented outside of the US. We are convinced that the FACE team will offer strong support to us and all buyers in Europe”, said Filipe Pampuri, CEO of Beetronics. “Beetronics is a dynamic outfit that designs the most beautiful pedals out there in the market. We secretly believe they have a couple of ‘classic’ pedals up their sleeve. The Overhive might just be one of them. We’re delighted with being their ‘face’ in Europe” - adds Guy Balbaert, Vice President International Marketing of FACE.